The head office of the Estonian state-owned railway infrastructure company Estonian Railways (AS Eesti Raudtee) will start work at the address 60/2 Telliskivi Street in the territory of the Telliskivi Creative City in Tallinn from the beginning of February. "The new office building is situated on Telliskivi Street in a creative city of the city of Tallinn, bringing us closer to a contemporary and modern business environment," Estonian Railways CEO Erik Laidvee said. 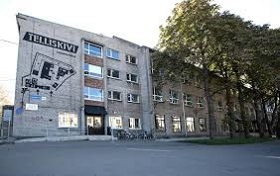 The office in the I-Building of Telliskivi Creative City brings together under one roof the Estonian Railways employees who used to work in three different buildings. The lessor was found in a public tender and the lease was concluded for five years. The offices on three levels of the building have a total floor area of slightly over 3,000 square meters. Until the end of January, the head office of Estonian Railways is situated at the address 35 Toompuiestee Ave. The relocation that was initially scheduled to take place in November 2018 had to be adjourned as the completion of the new building took longer than planned. The five-year lease agreement with lessor OU PLKV Invest was signed in November 2017.